There are several common mistakes that new riders make when first learning to ride horseback. Here are the top ten beginner horse ​riding mistakes and how to fix them. It is instinctual for us to use our hands and arms to balance us when we start to feel insecure. Beginner riders often end up with their hands way up in the air, sometimes at shoulder height. This leaves the reins much to long, and the rider then has no control of the horse. Or, the rider allows the reins to slide through their hands and lifts their hands to make contact, rather than shortening the reins. The Fix: Work on following the movement of the horse with your seat and core. Keep a light, even tension on the reins and keep your hands at hip level. Readjust the reins if the horse pulls them loose. As in the picture, there should be an imaginary straight line that goes from your elbows, forearm, wrist, hands, reins and to the bit in the horse's mouth if you are direct reining. If you are neck reining, you should be able to feel a very slight tension on the reins when you pull back. Keep your hands at hip level and your elbows at your side. Riding is more about balance than grip. Your muscles will be active, without being tense, and you don't want to be a clothespin on your horse's back. Clenching with your upper or lower leg or both is tiring and may be understood by your horse as a cue to move forward. Clenching and gripping will make your body tense, which can affect your horse's attitude. The Fix: When you sit in the saddle, let your leg hang from the hip. Allow your weight to fall down on your heel. If you're jamming your heel down, you may also be pinching with your knees or clenching with your legs. Keep your foot under you, rather than allowing your leg to swing to the front or back. There should be an imaginary straight line from your ear, shoulder, hip to your heel. This often happens when riders first learn to post the trot. Trying to lift yourself out of the saddle by rocking up (usually hunching the shoulders and trying to 'hop' out of the saddle) and standing on your tip toes will likely have you behind the rhythm of the trot and double bouncing heavily in the saddle. Your hands may go up as you try to counterbalance yourself. This leads to a grumpy horse and an unbalanced, uncomfortable rider. The Fix: Work on your leg position. Keep your lower leg still, with your feet under you as if you were standing on the ground with your knees slightly bent. Learn to use your core muscles to help you post the trot and not your feet. Having your feet rammed too far into the stirrups is uncomfortable, and can be dangerous if you're not using safety stirrups or wearing proper boots. The Fix: Make sure your stirrups are the proper length. The stirrup should just hit your ankle bone when your legs are hanging free with your feet out of the stirrups. Place your foot in the stirrup so the ball (widest) part of your foot is resting on the stirrup. Work on proper leg position. Whether we're embarrassed about our height, apprehensive about riding or trying to imitate hunched over cowboys we see in movies, slouching is a common mistake. Some nervous riders appear to want to curl into the fetal position as they ride. 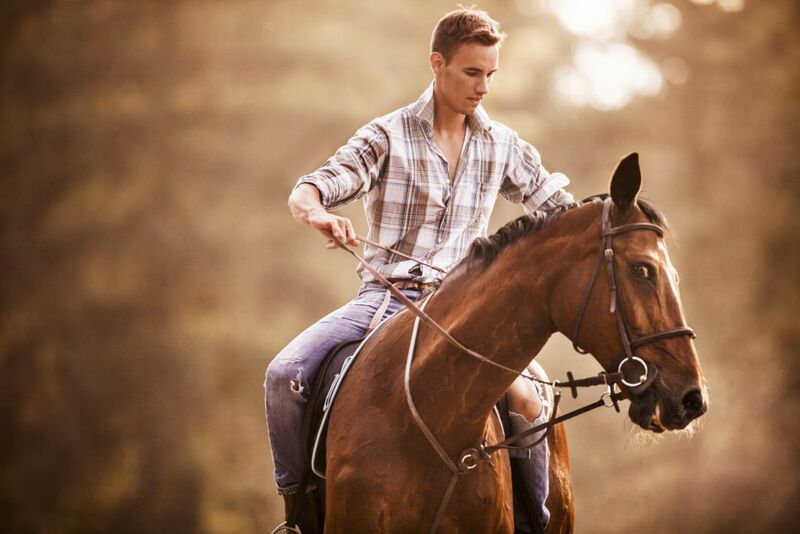 However, it's hard to control a horse while hunched, and your balance will be affected. Anything that affects our balance also affects our horse's ability to do its job well. The Fix: Sit up straight, but relaxed. Avoid going ramrod straight as that too can be a problem. Keep your chin up and look where you are going. Squeezing your shoulder blades back can make you feel tense, so instead, think of opening up your chest and letting your breastbone float upwards. You want to stay supple and tension free. Many new riders look as if they're sitting in a chair when they first get in the saddle. Their knees are drawn up and their heels may be up, or they may be forced down, with their feet pushed forward. Some riders look like they are trying to imitate jockeys. The Fix: This is similar to clenching with the leg. Work on letting your leg hang downwards from the hip, and keeping the proper leg alignment. Don't pinch with your knees. Horses move their heads when they move, and if a rider does not accommodate this movement, they will have the reins pulled through their hands. This leaves the rider with little contact on the bit, or ability to cue the horse with the reins properly. The rider then compensates by either lifting their hands high up or attempting to pull the reins with their hands almost behind them. The Fix: Riding is a constant process of re-balancing and readjusting. Cagey school horses are adept at rooting, so learning to stop this behavior can help. However, even at a walk, a horse's head bobs up and down, so the rider needs to move their arms and hands so the reins don't become too long. Let your arms hang down your sides, allowing them to swing subtly as if your shoulders were hinges. If the horse pulls forward, such as when it trips, sneezes or steps over something, learn to use your arms to give the horse more rein, and not let the reins slide through your fingers. Learn how to shorten your reins as you go. Furthermore, as you increase the pace, you will need to shorten the reins, because the horse actually lifts its head up slightly as it trots and canters or lopes. Even experienced riders do this when learning something new. However, beginner riders who are tense or are concentrating very hard, often hold their breath. The Fix: Smile, laugh, hum a tune, or try breathing in rhythm with the horse's strides. Pulling hard on the reins can confuse and frustrate the horse as the rider's legs and seat say 'go' but their hands say 'whoa'. Doing it over a period of time will lead to the horse ignoring rein aids because their mouth becomes desensitized, or they will toss their heads to avoid the pressure and pain. If the pulling becomes too constant, some horses will become balky, or rear to evade the pressure. The Fix: Learn to feel the horse's mouth without pulling. Squeeze back with your hands in downwards transitions, rather than yanking and tugging. As with letting the reins slide and get too long, learn to readjust the rein length as the horse moves. Hold the reins firmly but lightly, as if you were securely holding a baby chick in each hand. Don't squeeze too hard and squish your chicks! Beginner riders are often infatuated with their horse and want to look at it, or they're nervous and want to keep an eye on it. Looking down means you can't see where you are going, your head is down and neck is bent, which stiffens your spine. Any stiffness in your body makes it more difficult for your horse to carry you. The Fix: You might have heard that you should look between your horse's ears. This is only partially true. You really need to look where you are going. When turning, look at your destination, before cueing for the turn. This puts you in better balance, with your chin up, and your eyes forward. Before you ever get on a horse, make sure you are wearing a proper riding helmet and safe footwear. Not having regard for safety before everything else is perhaps the biggest riding mistake you can make, and one that can cause the most injury.